Description: Cap 3 to 15 cm, convex to flat or umbonate in age, margin possibly striate, dry but viscid when moist, yellowish-brown, smooth with tiny dark scales concentrated near the center; gills white to light honey, attached to slightly decurrent, reddish-brown stains with bruising or age; stem 5 to 20 cm long, .5 to 3 cm thick, tapering to base when clustered, enlarged to bulbous at the base when growing apart, tough and fibrous, smooth and pale above the ring, darker and hairy below, partial veil cottony forming a prominent ring; smell mild; taste acrid; spore print white. Habitat: Strongly parasitic clusters on hardwood, with long black rhizomorphs under the bark. acrid taste disappears when cooked. Note that due to host material, pending classifications or some other factor, this mushroom may cause digestive upsets in some individuals. 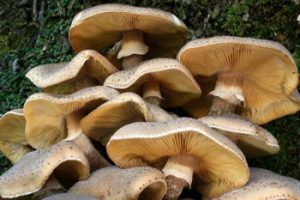 Notes: This distinct mushroom family is still in flux for an accurate classification, but the primary characteristics make it easy to identify. It is a very aggressive parasite that destroys the host cambium. A close cousin in southeast Oregon – A. ostoyae – is perhaps the largest and oldest organism in the world. In a medium bowl, combine eggs, salt and water, add the flour and stir together. Turn out onto a floured surface and knead until dough is firm and well mixed. Cover loosely with plastic wrap and let rest 30 minutes. In a large skillet over medium heat, saute mushrooms and onions in butter until onion is tender and mushrooms are dry. Add salt and pepper, remove from heat and cool. Roll out dough on floured surface to 1/8″ thick. Cut into 5″ circles. Reform scraps, re-roll and cut into circles. Put 2 T. filling in the middle of each circle. Moisten edges of the circle with a wetted finger. Fold each circle in half, and press edges together. Make sure it is entirely sealed. Bring a large pot of salted water to a rolling boil (or the pierogi can be made well in advance and frozen individually). Boil 12-15 pierogi at a time for 4-6 minutes after they rise to the surface. Remove with a slotted spoon to a buttered plate, keep covered and warm. Serve warm or pan fried in more butter then topped with caramelized onions and sour cream.